While an IDEA student’s foundational years at the academy level pave the way for every student to become college-ready, further emphasis is placed on every student at the college preparatory level to become well-rounded, think independently, drive their own learning, and become culturally aware citizens of the community. IDEA 6th graders gear up for the “AP for All” program that starts in 9th grade with Pre-Advance Placement (AP) classes taught in every core subject—reading, mathematics, writing, science, and humanities. These rigorous courses positively impact a student’s academic growth and readiness for college through challenging assignments, diverse course content, and college-level expectations. What does a typical, academic load look like for an IDEA 6th grader? IDEA 6th graders receive individualized attention from teachers who stress student responsibility. IDEA educators believe that students master material best when they’re the captains of the classroom, learning by doing, through rigorous, high-level-thinking activities. IDEA 6th graders pique their curiosity with Wit and Wisdom, a comprehensive curriculum for 6th grade students that inspires curiosity and takes them on a journey through authentic literature and discussion of big topics like the Great Depression, ancient and modern mythology, and courageous people throughout history. Students engage in deep study of important topics while taking ownership of their own learning and deepening their knowledge of the world. In humanities, 6th graders read primary documents, conduct research, and write analytical and research essays as they study history, geography, and culture around the world. 6th grade mathematicians take pre-algebra, where they further develop various math proficiencies: understanding, computing, applying, reasoning, and engaging. Focusing on these math proficiencies prepares students for rigorous math instruction in high school, college and beyond. In science class, 6th graders apply a variety of critical thinking skills as they perform laboratory experiments, read, write, and solve problems. By the end of the year, students not only have a strong grasp of basic science knowledge, but also a core set of skills they can apply through their years at IDEA and beyond. · The iLearning Hotspot, where students complete math software that challenges them based on their academic level. We know students learn best when they’re having fun; so, these software programs work like an educational videogame, and students love it! · The Accelerated Reader (AR) Zone, a space devoted to promoting a culture of reading to help our students unlock the world of opportunity and equip them for a lifetime of learning and enjoyment. Through the AR Zone, students read books, complete a test about each story they read, and keep track of the total amount of books, and words, they read throughout the year. The ultimate goal is to read one million words by the end of the school year. Our readers meet important milestones and receive incentives along the way. When students achieve millionaire reader-status, they partake in a special celebration honoring their reading achievements. Students dress up, are celebrities for the day, and families attend an award ceremony to commemorate this educational milestone. · A Physical Education class, which implements cutting-edge technologies from Adidas. Students wear wrist heart rate monitors that help track their physical activity during PE. IDEA’s physical education curriculum is centered around students improving their health and wellness. At IDEA Public Schools, we instill in our students the expectation that they will go to college. This expectation is woven in the fabric of everything we say and do. While IDEA’s Academy program promotes collegiate awareness and attainability for all, our College Preparatory program, starting in 6th grade, intensifies college-readiness not only through rigorous instruction of core subjects, but also through the education of the ins-and-outs of applying to college—financial aid, scholarships, writing statements-of-purpose, and more. Every student receives support from college counselors, who constantly monitor student progress, communicate with parents, and assist with applications for scholarships and grants that provide financial aid for our scholars. 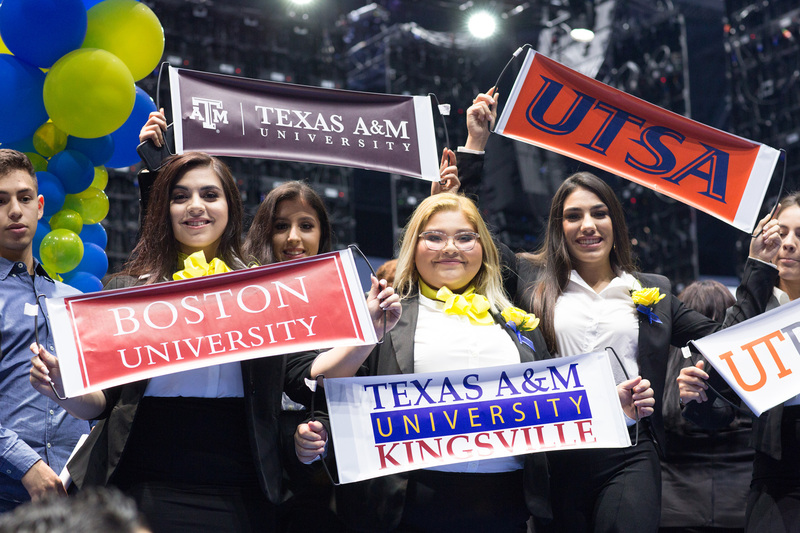 As experts at sending students to and through college, we know that colleges and universities love well-rounded students with diverse interests. Starting in 6th grade, our IDEA scholars are introduced to a robust assortment of extra-curricular activities. IDEA athletic programs include, but are not limited to, flag football, cross-country, tennis, basketball, baseball, softball, track and field, golf, soccer, and cheer. In addition to a thriving sports scene, our 6th graders can also get involved in a variety of clubs, which span a variety of student interests—community service, languages, farm and garden, politics, art, music, yearbooks, photography, chess, dance, and much more. Each year, our 6th graders anticipate the transition from Academy to College Preparatory. They’re ready to take on a rigorous, Pre-AP course load, while also participating in extra-curricular activities as they become resilient, resourceful college scholars with integrity.